Participants in the WKU Young Male Leadership Academy competed in the Educators Rising State Conference on March 5 at WKU’s Knicely Conference Center. 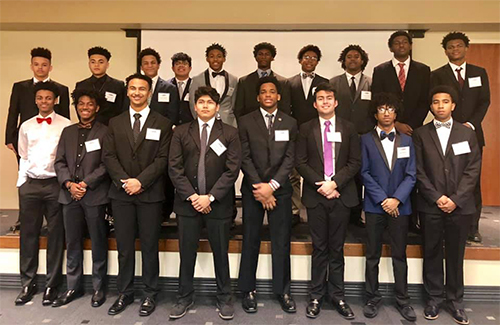 The WKU Young Male Leadership Academy (YMLA) is a college preparation and recruitment initiative, designed to develop leadership skills in young males of diverse backgrounds by exploring the teaching profession. The participants in the program attend Bowling Green High School, Greenwood High School, South Warren High School, Warren Central High School and Warren East High School. On March 5, 20 YMLA participants competed in the Educators Rising State Conference at WKU’s Knicely Conference Center. Educators Rising Kentucky gives an opportunity to students in the state to explore the education-related careers by providing hands-on teaching experience to become successful educators. More than 350 students from Kentucky attended this year’s Educators Rising State Conference and 114 of those will be competing at the national level this summer. YMLA students who participated on March 5 will attend the Educators Rising National Conference June 22-25 in Dallas, Texas, and learn from professionals across the country during the workshops and plenary sessions. Nine students placed in the categories of Ethical Dilemma and Exploring Support Services Careers and earned the opportunity to compete at the national conference. Five students received first place and were awarded $1,500 to assist with conference travel cost. The YMLA program is a partnership of Warren County Schools, Bowling Green Independent Schools and WKU.